For the most part we create a datagrid at design time by just adding a Datagrid control to a web form. One of the disadvantages of this as a developer is that for each report a user requests, a new Web Form needs to be created. Before long your project has hundreds of pages, which becomes in due course a maintenance nightmare. In this article, we are going to create a simple web form, and create a datagrid dynamically using code. 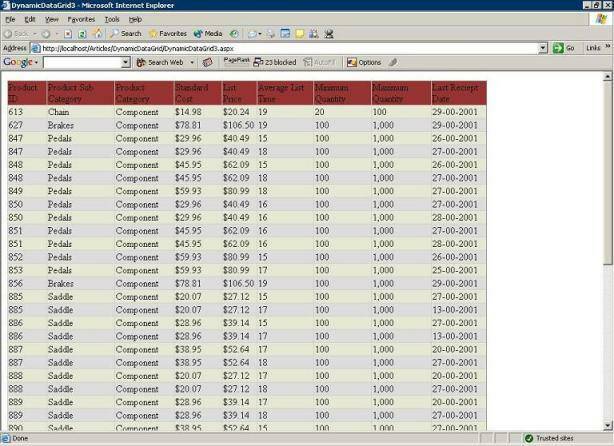 We are then going to add columns to this datagrid based on the results returned via a SQL stored procedure. This dynamically created datagrid will render the results of any SQL Query or stored procedure. Let's see what our code behind file to create a datagrid looks like. So let’s build and compile this, and see what we get. The results are not bad: we did what we set out to do. We created the datagrid on the fly, in the code behind file, and populated it with the results of our stored procedure Dynamic_Datagrid. The problem is that our datagrid looks mediocre and our users are not very happy with it. Fortunately, you can set Datagrid properties programmatically. Now we have a better looking grid, - this example is just a representative sample of a few DataGrid properties. Refer the DataGrid class to get a comprehensive list of the properties of the DataGrid. So far we have been making use of the AutoGenerateColumns property of the Datagrid control. When this property is set to true the Grid creates a bound column for each field in data source of the Datagrid. Whereas we haven’t specifically set the property to true, this is the default behavior of the Datagrid. Our columns are not formatted however, and we might get a little more functionality from this code, if we don’t rely on AutoGenerateColumns. After adding the above line of code, we will need to add columns individually to the datagrid. Since I am building on the first example in this article, we will assume I already have a populated DataSet (ds), and I only have one table, so the data is returned in Table. We are going to loop through the columns on the DataTable and add them to our DataGrid. 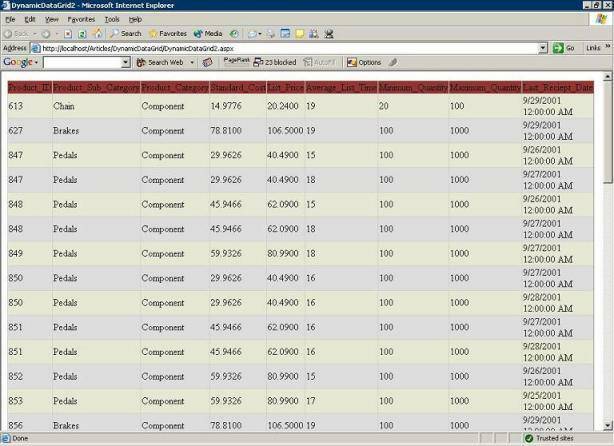 To set the properties of each column we will write a new method: the CreateBoundColumn method. Now, it is time to take a look at the CreateBoundColumn method. This method creates a new BoundColumn object and binds the column to the associated field in the DataSet. Next the method prettifies the column heading by stripping the '_', and then sets the formatting of the column based on the data type in the setFormatting method. Its time to take a look at the setFormatting method. Of course I haven’t covered all data types, but you can expand the switch statement to cover other data types you might be using. 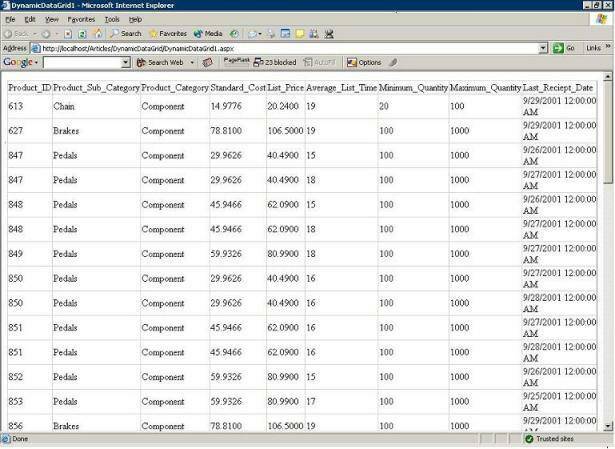 Note: the data types being used here are NOT the SQL data types, but the .NET data types. Let’s take a look at our page now. Conclusion : There are a lot more properties you could set to make this data grid fit your application needs. In a real world scenario, we would want to add sorting and paging to this too. The intent of this article is, to provide an insight into how to create a web form with a dynamic datagrid, created based on the data returned. Hopefully this will help building applications faster.